Resting in the Gardens of Bali « Kathy Murphy, Ph.D.
Gardens are abundant in Bali. Some are well tended, as found on the temple grounds or the hotel properties, and some are just random tracts of natural beauty that appear on the mountains and cliff sides. Wherever one finds a garden, you can feel the impulse to slow down, take a breath, and appreciate what it has to offer. Gardens are a wonderful place to rest. 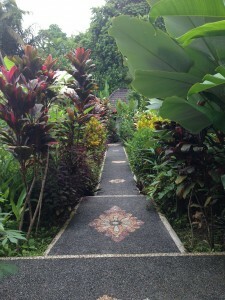 We began our spiritual pilgrimage in the beautiful gardens of Bali. We figured this was a perfect way to prepare ourselves for the upcoming 3 weeks in chaotic India. Here we stay in one location for two weeks, but in India we will be moving around from one crowded spot to another, sleeping on trains and staying on the move. 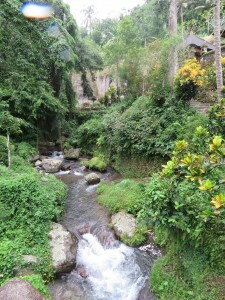 So it felt just right to go to Bali first to rest in the gardens for awhile. And, little did I know, I was going to get sick the first week – so resting was perfect. For 12 days we spent our mornings meeting in community in glorious surroundings with Atum teaching – using stories, poetry, dance and song to help us open the door to our inner garden. In the afternoon we ventured out into the country to visit places that would further explore this deeply spiritual country as well as continue to cultivate our own inner well-being. 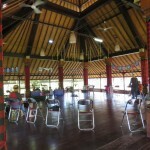 We visited temples, attended several cultural events, and met Balinese people. My personal favorite was our visit to the temple, Pura Tirta Empul. The main attraction here is a long rectangular pool carved of stone, filled with koi and fed by the sacred spring via 12 fountains. 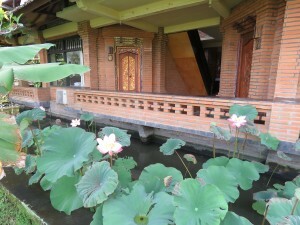 Worshipers first make an offering at the temple, then climb into the main pool to bathe and pray. Many collect the holy water in bottles to take home. Neareby there are two smaller pools fed by the spring. Several of the people in our group participated in this healing ritual. It was inspiring to watch as they prayed their way through the pools. 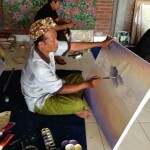 Balinese spirituality colors every aspect of their everyday life. The religion, practiced by all but 5% of the island’s population, is a variant of India’s Hinduism called Hindu-Dharmaism. It teaches that every living organism has both good and evil spirits. 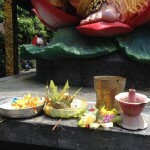 Three times a day, every day, the Balinese people make small offerings to the gods to express their thanks for all of their blessings and to ward off the evil spirits. They are placed at entrances, on statues, on the walkways, and on dashboards. If you aren’t’ careful you could easily step on someone’s offering as they are placed everywhere. We attended traditional Balinese dances (see video). The masterful art of these young dancers is a marvel. The intricacies and precision of each movement was fascinating. We also visited local craftsmen who were painting and carving as a part of their spiritual practices.In Bali, people believe if they make things beautiful the gods will come visit.Throughout all of the experiences, however, were the people – the heart and the soul of Bali. My first time in Bali was 27 years ago. As we left the airport to drive to Ubud, I was shocked at the traffic, the noise, and the smell of thousands of motorcycles that darted in and out between the cars. My memory of Bali had been peaceful, smiling, gentle people with terraced rice fields dotted by temples and small offerings to the gods everywhere. Had Bali been crushed by the hoards of western tourists and legions of Eat, Pray, Love women in search of their one true love? 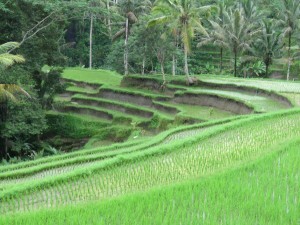 It felt like it on the ride to Ubud and it made me very sad. But there is good news. One block off the busy streets there are small temples and the people are still living their spiritual practices everyday. The taxi drivers do hustle you for a ride but if you say no, they politely stop, smile, and say ok. 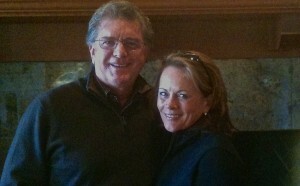 The optimistic ones ask, “Maybe tomorrow?” The gentleness is still there and so are the smiles. The picture above is of Edi, our driver. What struck me was that he did not ask me what I did for a living but instead asked me about my family. 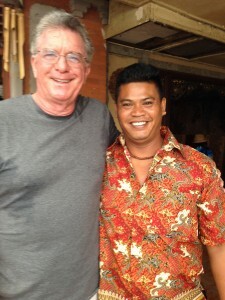 A Balinese driver told us when asked why do you smile all the time, “I am honoring the good in everyone I see”. What a beautiful practice! What a better world we would be if we all become a bit more Balinese in how we lived our lives – if we all greeted each other and simply smiled. The garden is a perfect place for rest, reflection, rejuvenation, and remembrance. However, it is not a place to stop. After a quick visit to Sunar, a beautiful beach in Bali, and after I finish this post, Michael and I will board a plane to New Delhi. Our spiritual path is to take what we have learned in the gardens of Bali and in the work we’ve done on our own inner gardens into the poverty and overcrowdedness of India. We hope to sew some of the good seeds of peacefulness, ease, harmony and love into the midst of the chaos – not only in India but in the rest of our world as well. This entry was posted on Friday, March 13th, 2015 and is filed under India, Journey, Spiritual Journey, Travel blog, Uncategorized. Beautiful pictures and inspiration of how we can see life and contribute in this world–with peace, love, serenity, and forgiveness. Thank You so Much for sharing!!! May you both continue your journey with love…. Such beauty and peace. I love the smiles. 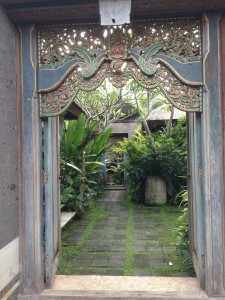 Thank you for sharing and letting us experience Bali vicariously through you. I am loving getting a glimpse of what you are experiencing. Remarkable. Thank you so much for sharing! I just watched the video of Atum. What a wonderful explanation of gardens and all of the ramifications. He has such a calming way about him when speaking, all extemporaneously. Great update. I’m loving your trip and recalling my time in Bali. I really like the story Mike told about the cab driver’s smile – that says it all. Safe travels to India neighbors. Amazing, Dr. Kathy. I’m so happy for you. The pictures are stunning. I feel like I’m there with you and Michael. So good to see the pictures of both of you. Thank you for sharing your journey with us.